Mike Gold: Time Is On Our Side? 'This Is Us': Randall Takes a Trip Down Memory Lane With Dad Jack -- Plus, 4 New Revelations! Jiro Nakajima: [to Kiichi] You see, I obtained a Court Order forbidding disposal of our assets. Until the case is decided, we can't spend a yen. Yet you did this. And what you did was illegal. Your objection will be overruled. Toyo Nakajima: But Father brought back the money. Jiro Nakajima: Don't accept it. Jiro Nakajima: Wait! Wait, Father! I felt I had to post because this film, not one of my favorites by Kurosawa but still a one of quality and intelligence, keeps getting bashed by reviewers. The low score (compared to other Kurosawa films) shouldn't discourage potential viewers. Granted, this film takes more patience than some of his other films. However, the subject matter of the atomic bomb and how Japanese society and individuals deal I thought was very seminal. The whole concept of fear is deeply imbued into the film and it questions the sanity of the viewer and the world who live under the constant threat of universal destruction with ignorant self-assurance. The ideas are intelligent and presented with clarity. This film is complete and good in itself and doesn't need to rely on the name of Kurosawa to justify itself. 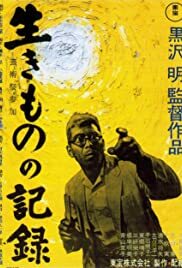 Not a good Kurosawa film to start off with if one is trying to nurse an interest in his fecund movies but a good movie to watch nonetheless particularly if one is at all curious about how Japanese people feel about the horror of the atomic bomb.